Another craft beer year is in the books, and by all accounts is was a real hum dinger. A record number of new breweries opened across the Commonwealth, the Mass Brewers Guild grew by leaps and bounds, Sam Adams finally got a taproom, and Garrett Oliver suggested the New Engalnd IPA was merely a fad while we all just laughed and laughed. But seriously, it was a pretty amazing year to be a craft beer drinker here in the Bay State, so let’s take a look at some of the highlights. We’re not going out on a limb when we say that the biggest craft beer story of 2017 was the breakneck pace at which new breweries and taprooms opened across Massachusetts. Thirty one new breweries debuted, by far the most in a single year, and eight others that previously existed opened new or bigger breweries. Here’s the full list. Assuming no one else opens before the New Year (though a couple are very close), the total number of commercial brewers will finish at 155, having risen an astonishing 25 percent in just one year. The number of breweries boasting taprooms (full pours and flights served and consumed on premises) also ballooned, to 104, a surge of some 33 percent. 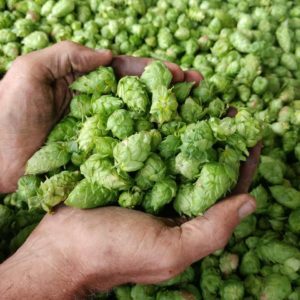 Be it coffee, chocolate, malt, or hops, such as these from Northfield’s Four Star Farms, local artisans collaborated with brewers for specialty beers on a frequent basis in 2017. A glance at our list of breweries-in-planning, as well as existing breweries we know of that are planning to add taprooms, leads us to believe that both trends are likely to continue, in earnest, throughout 2018 – please insert speculative reference to craft beer bubble here. Another trend worth examining is the hyper-local preference of consumers. In an excellent piece entitled “In Defense of Millennials,” which appeared recently in BrewStuds, writer Will McCameron explains that “this phenomenon [hyper-local] has created new markets, in which everyday people are being connected to local artisans, bringing about the birth of the localvore, the consumer who primarily seeks out locally handcrafted goods.” That includes craft beer. The Brewer’s Association reports that a majority of Americans now live within 10 miles of a craft brewery. Examine any of our regional brewery maps and you can see for yourself that it’s clearly the case here in Massachusetts. In all, 75 cities and towns across the state now have their own visitable brewery, and 16 more have a production brewery that produces a local brand available at retail outlets. That said, nearly half of the state’s 50 largest cities are still waiting for their own locally brewed beer. Some, like Springfield, Peabody, Marlborough, or Fall River will have their thirst quenched in 2018, but dozens of others have yet to join in the fun. 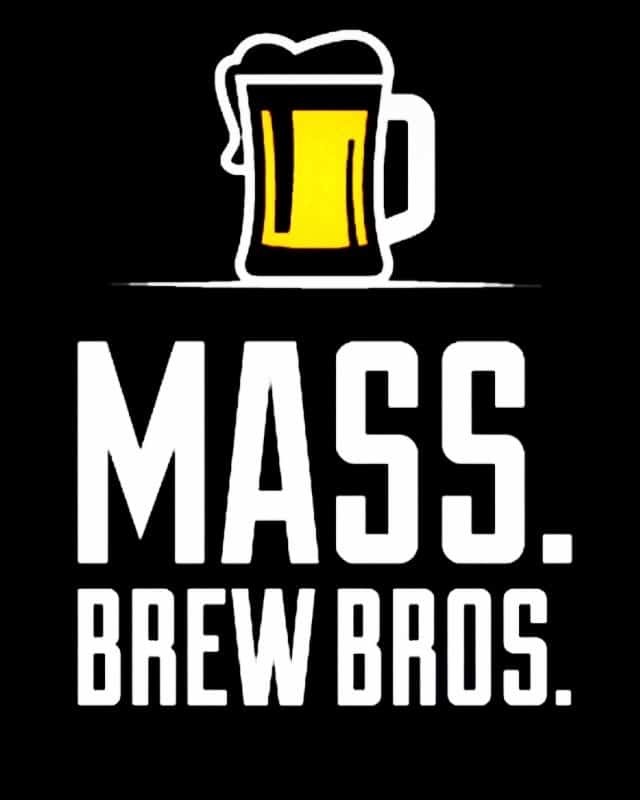 The Mass Brewers Guild also grew by leaps and bounds in 2017, increasing its membership of both brewers and associate members, increasing its quality and number of events, and replacing the outdated paper passport program with the state’s first mobile app, “Mass Craft Beer.” We’ve teamed with the MBG to provide the brewery data for the beer trail map, which has already been downloaded by more than 4,000 users since it launched in September. Another of the guild’s major initiatives was the continued push for improved legislation regarding the state’s archaic alcohol laws, particularly franchise law reform, self-distribution rights for pub brewers, and allowing farmer brewers to pour and sell their products at famers markets. The MBG’s Government Affairs team traveled to Capital Hill to lobby for craft beer tax reform, and at home garnered more than 2,300 petition signatures in support of franchise law reform. Stay tuned, initiatives are ongoing and will extend well into 2018. 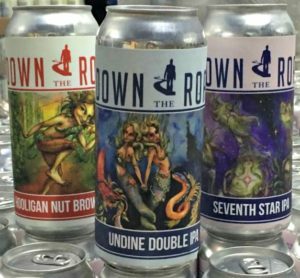 Eye-catching artwork on 16-ounce tallboy cans, like these from Down The Road Beer, continued to gain in popularity during 2017. One of the year’s most surprising stories was Harpoon’s October acquisition of established contract brewer Clown Shoes Beer. We asked back in 2016 if a Bay State brewery would get bought by big beer, but it never donned on us that one of our own breweries would buy another. It probably should have: acquiring rather than competing probably makes economic sense for some of the state’s largest breweries given the stagnant growth they’ve experienced in recent years – especially with the likes of Jack’s Abby, Night Shift, Wormtown, Newburyport and Lord Hobo rapidly ascending to regional status. In such a dynamic market, it will be interesting to see what other surprises 2018 has in store. The year wasn’t without its controversies, disappointments, and head scratchers. Successful chain Craft Beer Cellar backed away from it’s intent to implement a “do not sell” list after a leaked internal memo stirred up a bit of a public controversy, beer ratings apps and forums continued to server no one other than IPA drinkers, and Tree House Brewing expanded into a new state-of-the-art brewery in Charlton but on most days its adoring fans continued to wait in long lines. In other prominent news, a judge upheld the ABCC’s record 2.6 million dollar fine against distributor Craft Brewers Guild for its illegal pay-to-play practices, and a handful of Massachusetts breweries, including Paper City and Blue Hills, were forced to close their doors. 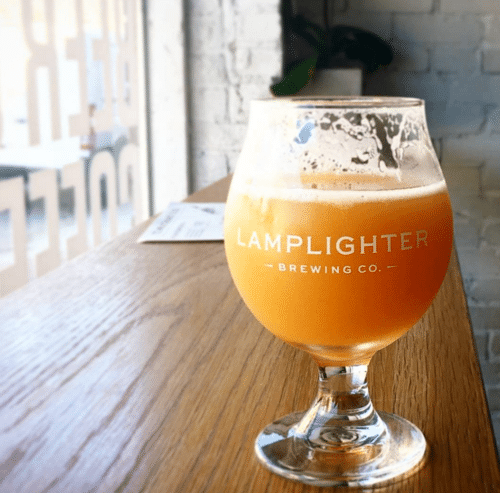 Neighborhood breweries, like Lamplighter in Cambridge, named Eater Boston’s Taproom of the Year, were all the rage in 2017. On a more positive note, women continued to expand their presence and influence throughout the Bay State’s brewing industry, Cambridge Brewing Company’s Will Meyers was honored by the Brewer’s Association with the prestigious Russel Schehrer Award for innovation, and the first-ever Rack AeriAle, a state-of-the-art barrel-aging system that dispenses draft beer using different combinations of C02 and nitrogen, made its debut at the barrel room in Eataly Boston’s new Terra restaurant. If you haven’t been yet, put it on your list of New Year’s beer resolutions. Another noteworthy addition to Boston’s rapidly improving craft beer scene was Trillium’s Garden on the Greenway. A sorely needed addendum to the Fort Point retail location which doesn’t pour samples, it provided parched city dwellers and visiting beer aficionados a cherished opportunity to sit and sip the brewery’s sought after beers outdoors. In an effort to continue what the brewery’s co-founders describe as a “growing initiative to cultivate temporary seasonal spaces where patrons can enjoy our beer,” they recently opened an indoor winter garden at the historic Roslindale Substation. A story to be filed under the heading “if you can’t beat ’em, join ’em,” was the launch of Night Shift’s new distribution arm, a separate company with the goal of disrupting the current wholesaler landscape. How? Offer a better model for delivering their own beer as well as nearly a dozen other craft brands (including Abandoned Building and Devil’s Purse) throughout the state without locking them into lifetime contracts. In Western Mass., regional power Berkshire Brewing also began distributing competitor brands such as Amherst Brewing and Stoneman Brewery, both new contract clients. The net result of both moves is that more Massachusetts breweries have been able to extend the reach of their beer into the waiting hands of eager consumers all over the state. What will be interesting to see in 2018 is just how committed craft beer consumers are regarding current trends, those we’ve already discussed and a myriad of others. Will there be continued interest for anything and everything new? Can demand continue for high-priced sours, juicy IPAs, and barrel-aged beers? Are we headed for a shakeout of sorts, including more consolidation, and might that be a good thing for the industry? What’s for certain is that we’ll be watching, craft beer in hand, as everything unfolds. Hoppy New Year. Hey! Thanks for the shout out and kind words!